Anyway, we need more feed. 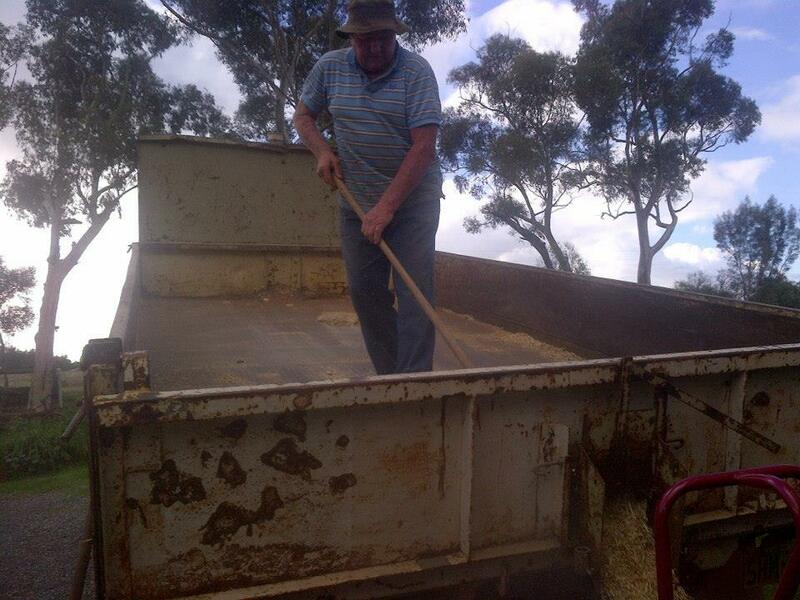 Farmer John put us in touch with a local farmer who had some waste grain that he needed to get rid of. It was in some bulk bags, and half was covered by a tarp, it had been out in the open. 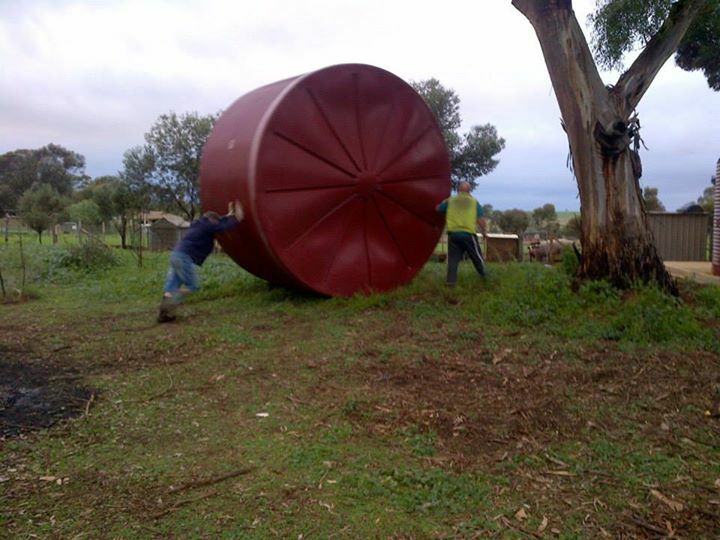 We guessed there was about 6 tonnes, and the farmer was willing to let it go super-cheap just to get rid of it. As it turns out, some was actually ruined, and not even good for stock feed. Farmer John managed to score us all of it for free, and by the looks of it there should still be 4 or 5 tonnes of useable grain. Yay for Farmer John! Loading the grain into bins. 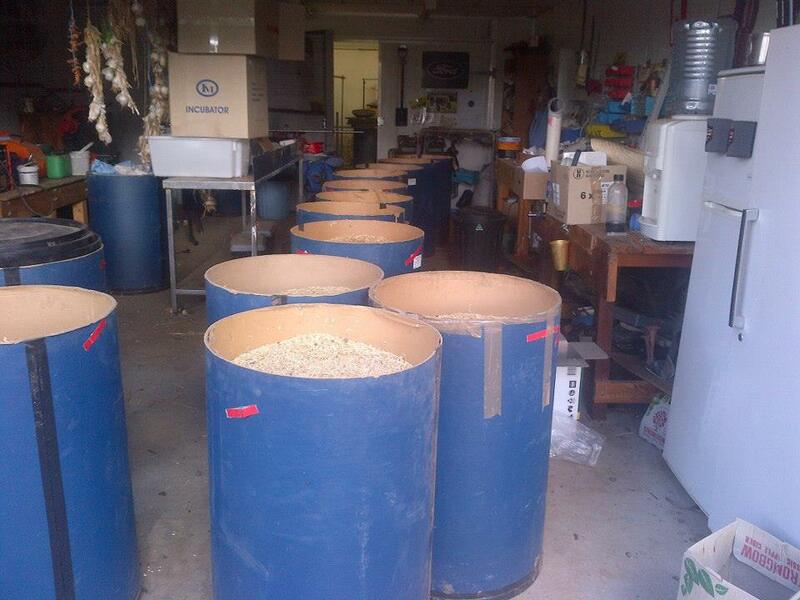 This is what 1.5 tonnes of free grain looks like. Farmer John has also put us onto some wheat screenings, which is the stuff that is too small to sell commercially. This is the perfect stock feed as it’s relatively high in protein. 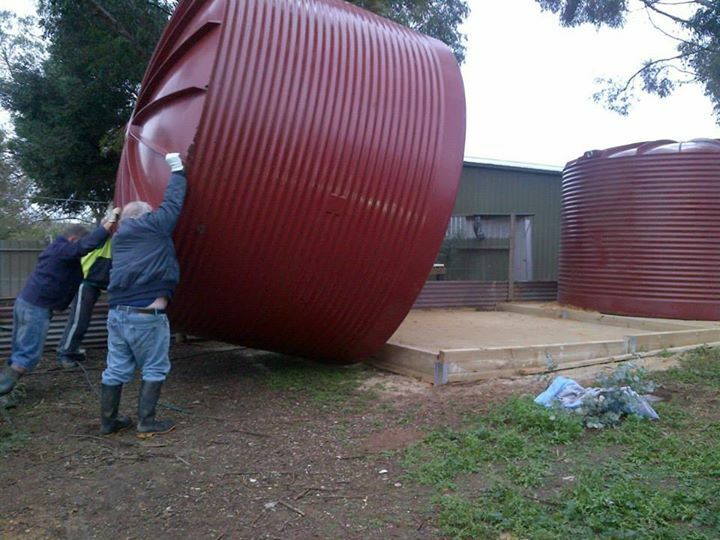 John is getting rid of most of his farm equipment, so we’ll buy a couple of silos, put them at our place, and hopefully fill them up with this cheap grain. With luck we’ll have near 20 tonnes of grain on hand, though if we expand the way we want, that will end up being a fraction of what we need. 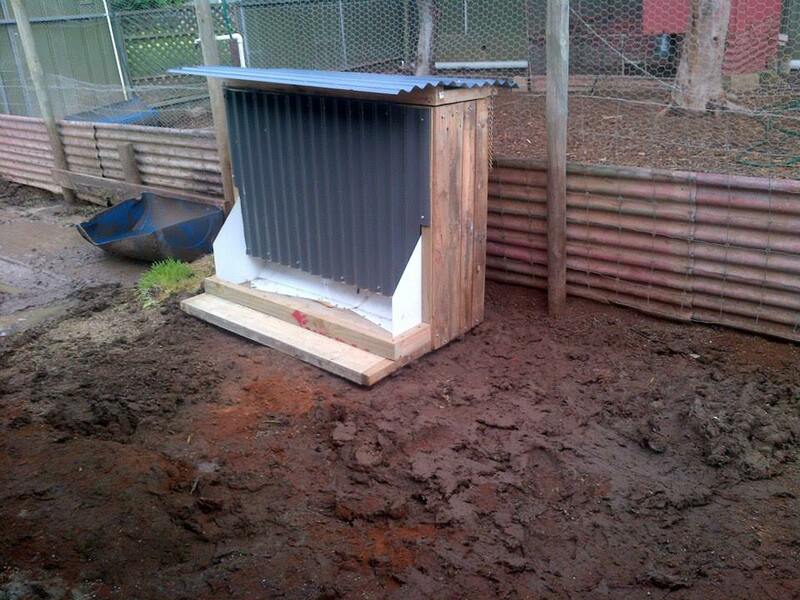 In April we made some pig shelters using sleepers. This allowed us to make them super-solid and rugged. They can stand up to even a 300kg pig rubbing its fat arse for all it’s worth, and in fact won’t even budge. 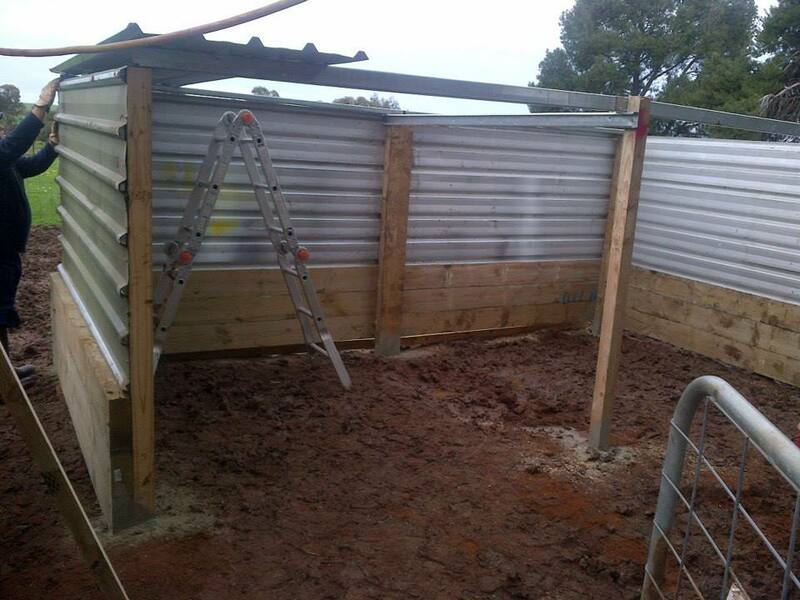 At the same time, our farrowing shed, a 3m x 3m garden shed, is a little flimsy for pigs. We have sleeper lean boards up, and have reinforced it, but they still beat the hell out of it. Now that we want to expand our operations and farrow our girls in pairs, we’ll need a larger and sturdier shed. 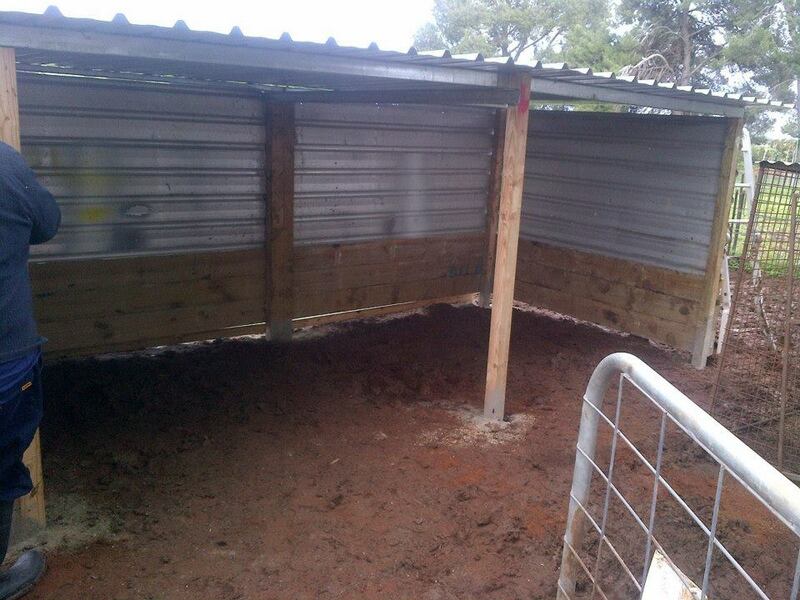 We decided to expand the design of our shelters and use it for the new farrowing shed. 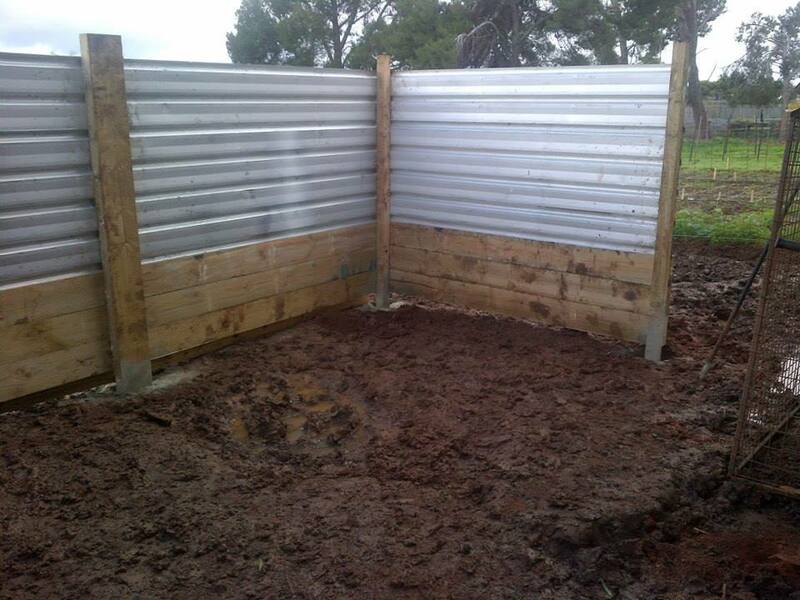 The start of a 2.4m x 4.8m farrowing shed. We prefabricated the sides, minus the tin. We decided to go 3 sleepers high. That’s 600mm, which is high enough for the gilts to rub on. They’ll end up maybe 200mm higher than that themselves when fully grown, but there’s not real need to go that high with the sleepers as the bits they like to rub are lower. 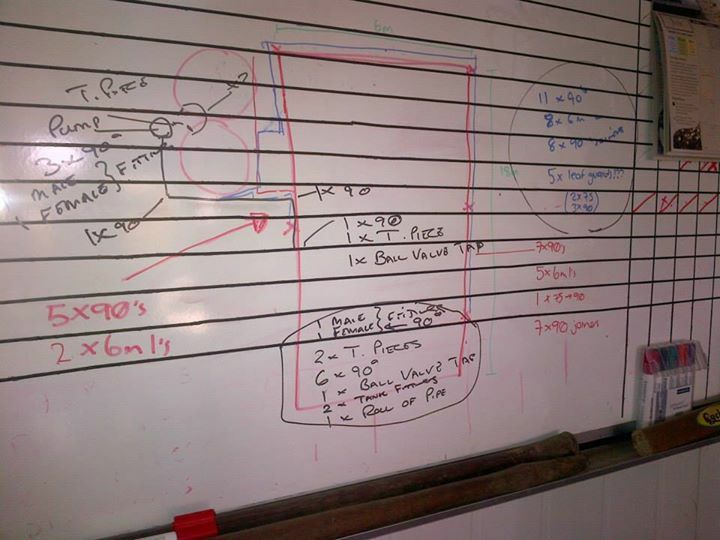 We also worked out a way to use the sleepers as uprights. 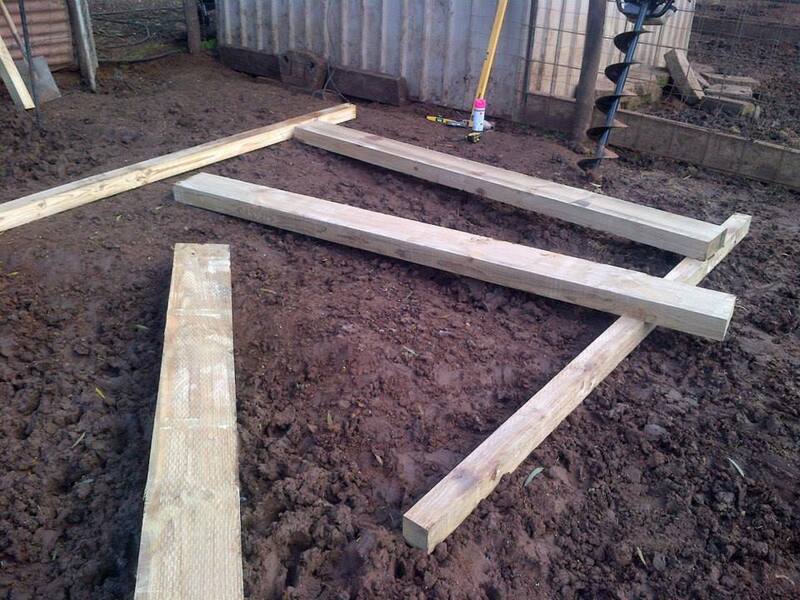 The timber yard cut sleepers length-wise for us, giving us 75mm square bits and 50mm x 75mm bits. They’re perfect as uprights, and really inexpensive. Because we were using 2 sleeper lengths along the back, we even used a whole sleeper as an upright, as it gave us much more area to attach to. The sleeper part done. And yes, dad is dropping the drill. This is the lowest point. You can see how much higher the sleepers are than the ground level. We were lucky enough to have some reclaimed tin from when we stripped the side from the small shed. 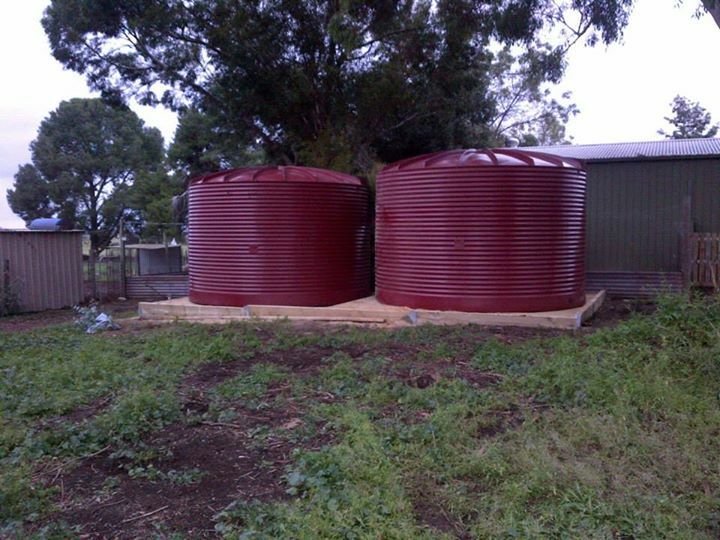 We had more than enough to use to clad the farrowing shed, and they actually look pretty good. The tin cladding is up. 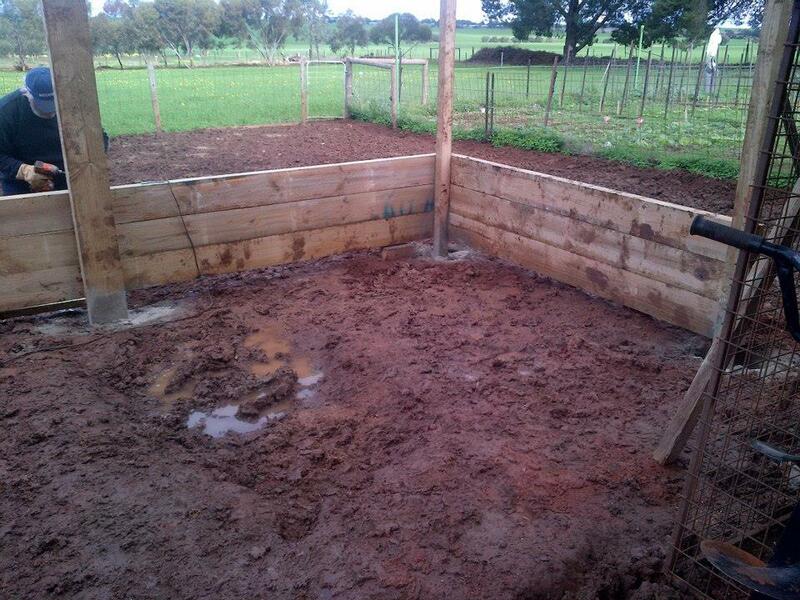 We did the roof similar to how we did Clarisse’s milking shed. We used c-channel along the back and front, with the front standing higher to give us good fall towards the back. We put another across the middle to add some rigidity too. 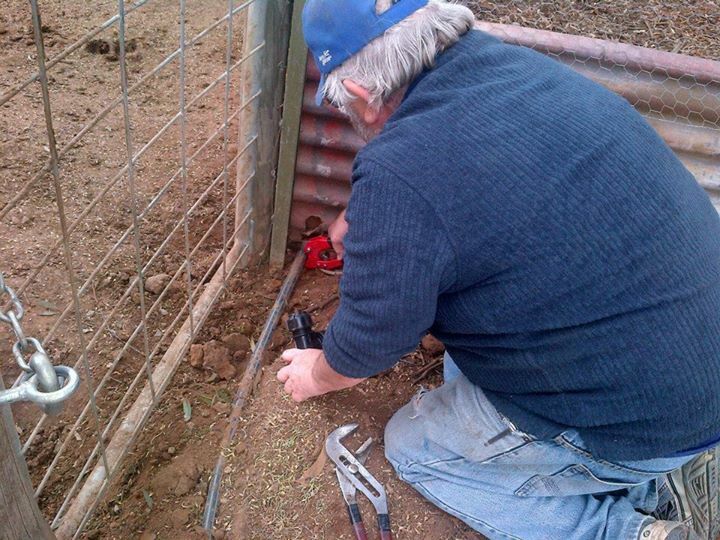 Lastly, we ran power over from the other farrowing shed and put a power strip in. 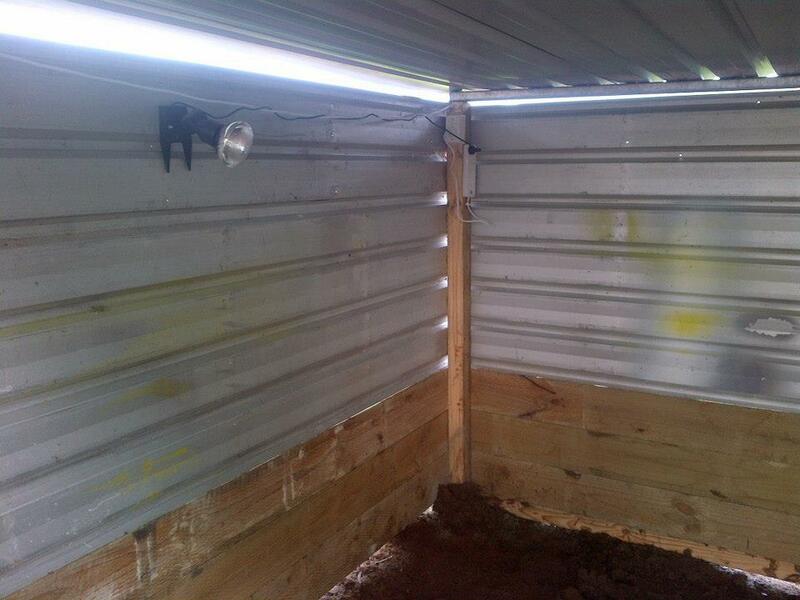 This shed will have two heat lamps and a flood light, so the power strip seemed a good idea. All that’s left is the creep area, which we can do over the next month. The real challenge with this shed, and with everything we build here, is that the land slopes towards the south and west. 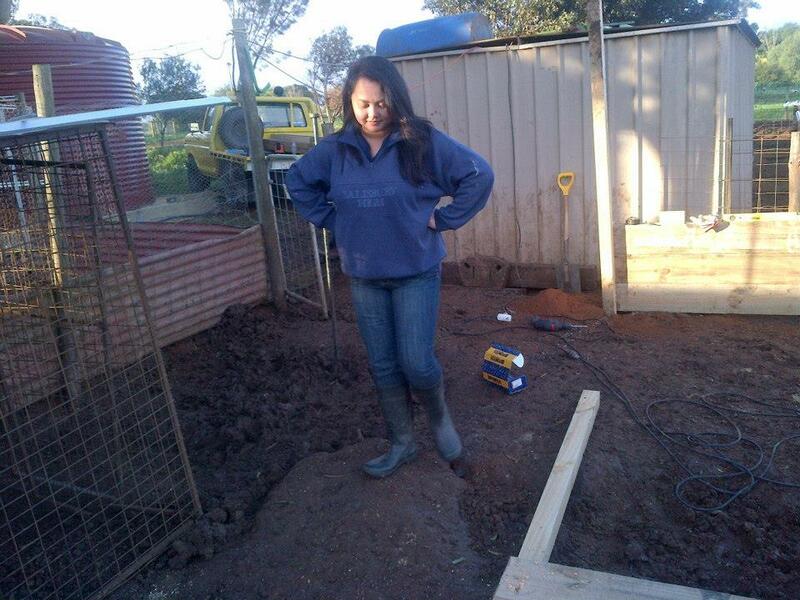 With the shed, we started on the high part, dug in a little way, and made everything level with that. By the time we were at the opposite corner, we were significantly higher than the ground level. 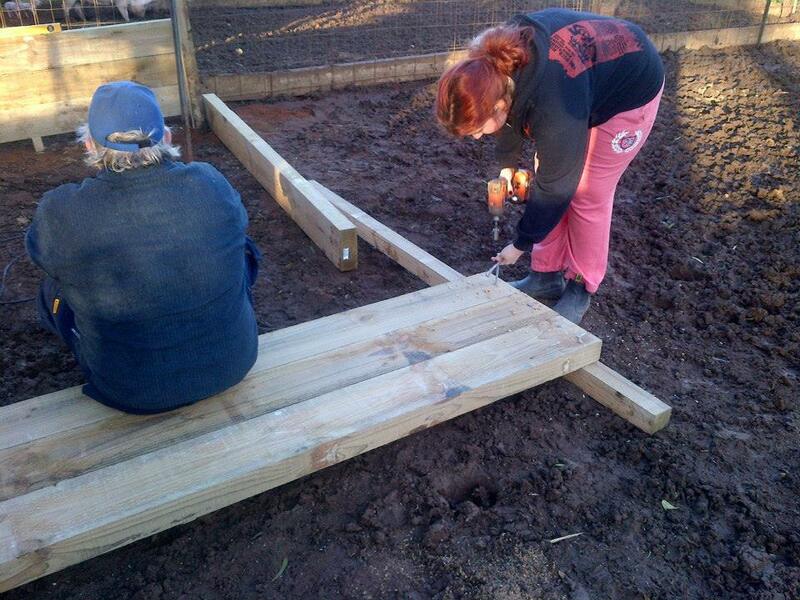 We ended up having to modify things a little to make sure we had enough post in the ground. 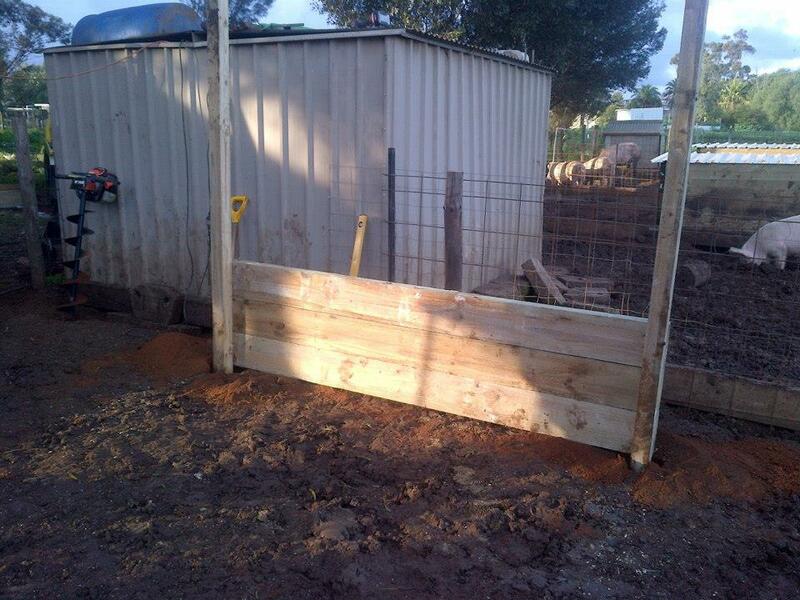 We used a couple of lengths of the 50mm x 75mm along the back to fill in the gap down the bottom. 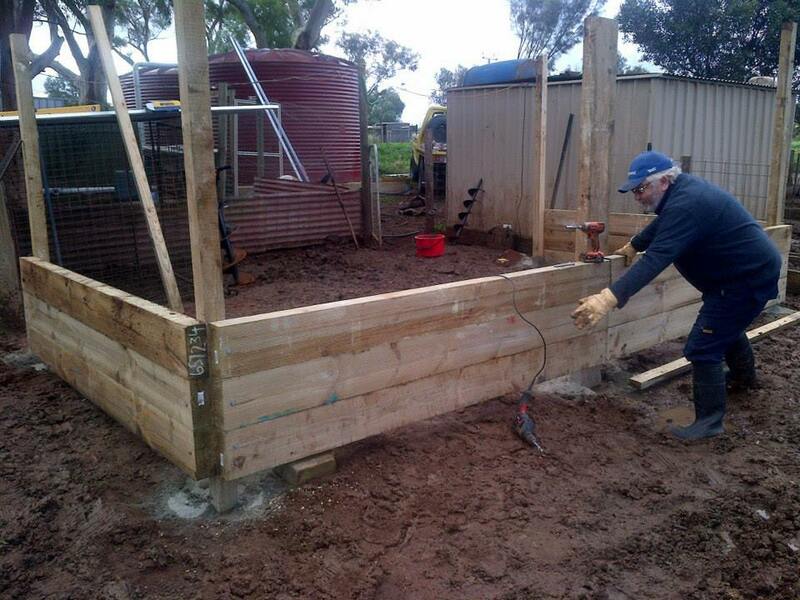 We also reduced the overall height of the shed from the plan 2.1m to 1.8m. It ended up working well, and I actually think it’s a little better being a little lower. 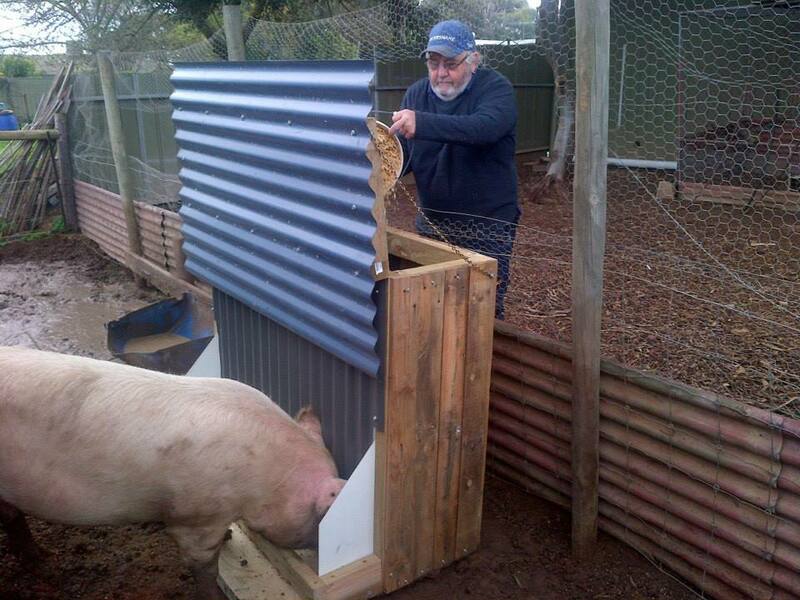 The other good infrastructure project we managed was a pig feeder prototype. What we wanted was a good, solid, sturdy feeder that was still light enough that we could carry it and move it if required. We came up with a design that is 4 feet wide and a little shy of that high. 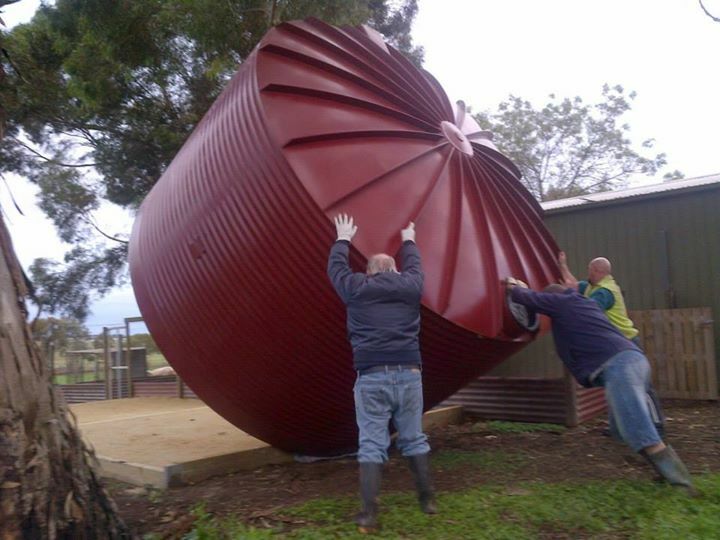 It has a baffle that directs any feed we drop in to the front, and feeding trough area. It means that we’ll be able to load it with a lot of feed if necessary, and it will basically gravity feed out as the pigs eat. Dad and the first test of the feeder. 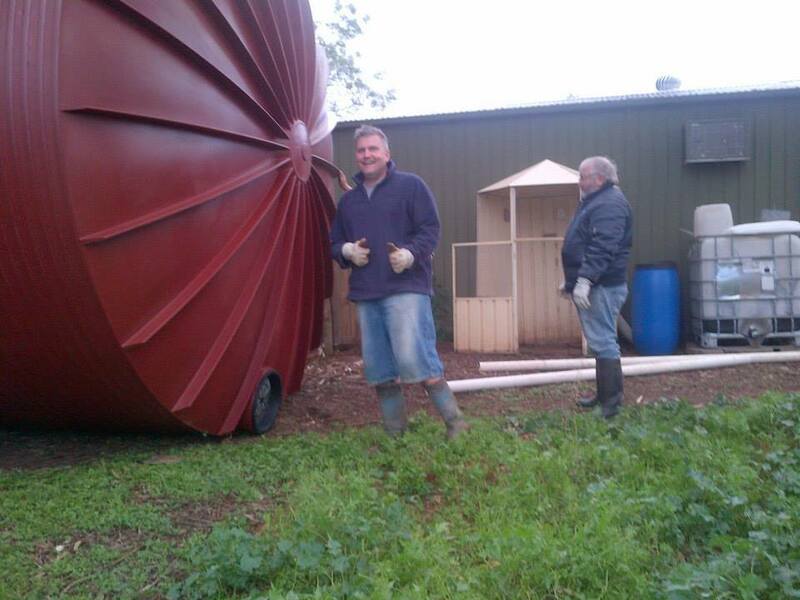 This is the baffle that makes sure the grain gravity feeds into the trough. This prototype is a little heavier than the mass-produced variety will be. I knocked apart a couple of hardwood pallets and used the wood to clad the feeder. This makes it a decent two-man lift. I think the next one, and the dozen or so after that that we’ll need, will be clad in tin. This will make them lighter, and also a bit quicker and easier to make. Either way, this one works perfectly, and proves the design and concept. 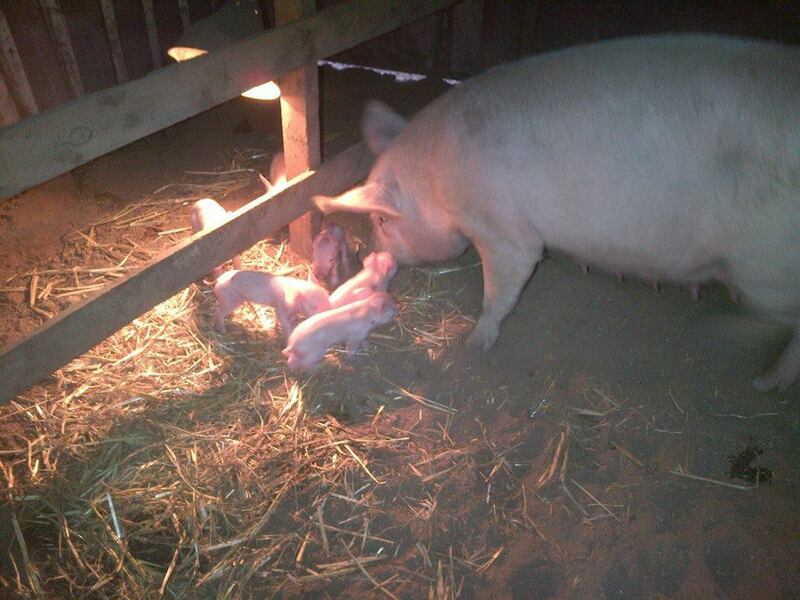 The same night I went to check on Ziggy, Bertha had her babies. I went out at 8, and she’d had 4. The creep was set up, but the light wasn’t on. The 4 babies were scattered around the shed and freezing. I got the lamp on and gathered the babies up, but one was knackered. We got some milk into him and warmed him up, but he was dead the next day. The first 7 we saw, 5, 6, and 7 of which we watched born. Number 8 came after this photo. The second-from-the-left was the sickly one that didn’t make it. You can tell even here that he wasn’t real well. We saw her give birth to the last 4, making a total of 8. However, we found a dead one under her the next day. It looks like she’d been laying on him the entire time. That’s 9 born, at least 8 born alive, and 7 survivors. For a young gilt and an accidental pregnancy, I’m going to call that a win. The babies are tiny, because she’s quite small to be giving birth. She seems to be doing a great job though, and has recovered quickly. I’m worried that she won’t have enough milk, but we’ll have to see. Seriously, the babies are super-tiny. The creep, for the first time, is working perfectly, and I think it’s the heat lamp positioning. We put it down low in the middle of the creep. 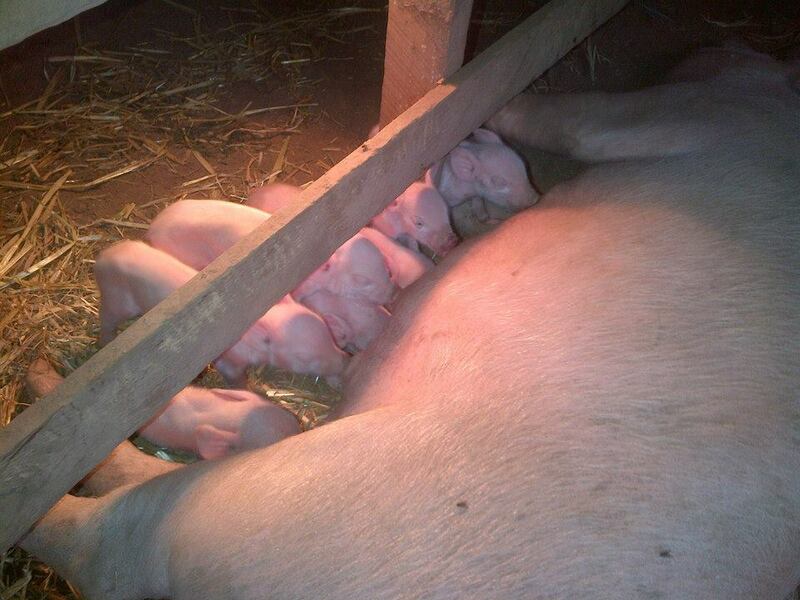 The babies are under it and Bertha is laying on the other side with her teats towards them. It’s working perfectly. They are instinctively good mums. 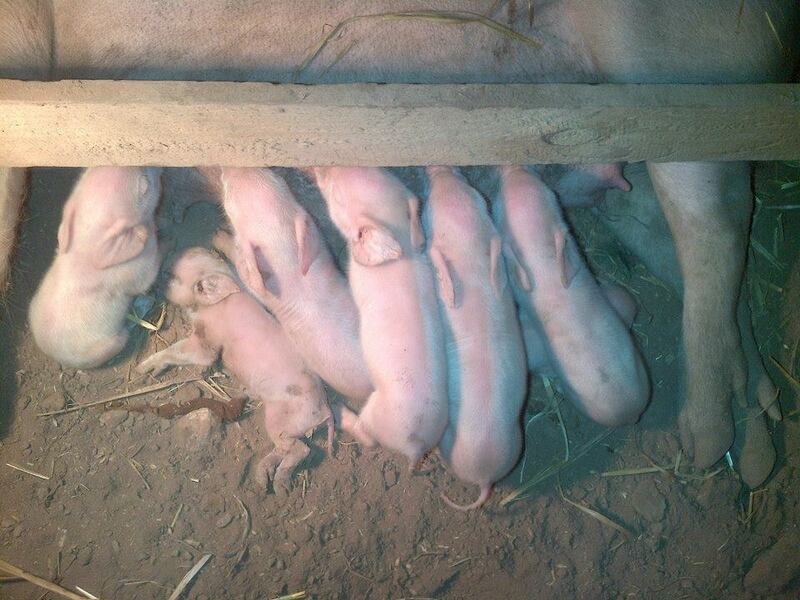 Active piglets! They’re all of a couple of hours old. This shows the creep barrier working perfectly. 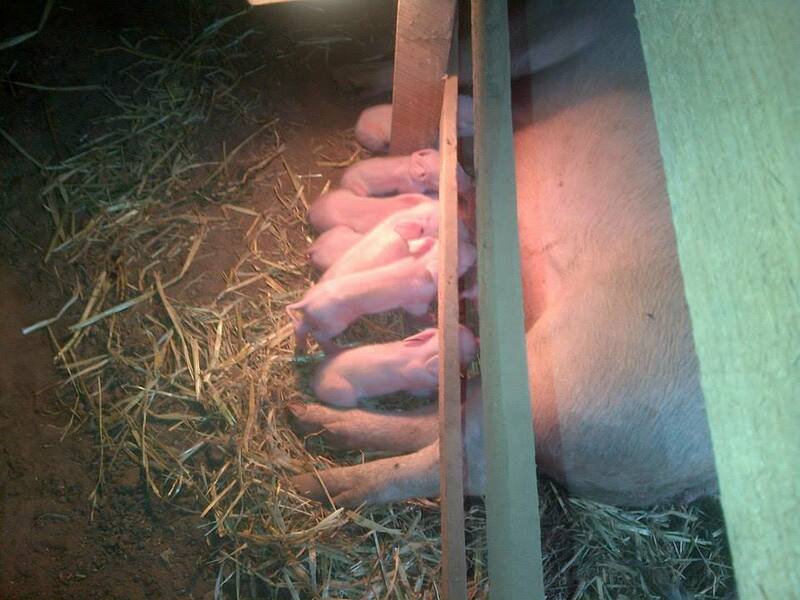 Warm piglets on one side, giant mum on the other. On June 9th we were lucky enough to score a half-tonne of seconds apples from The Apple Man (not his real name) in Gawler. 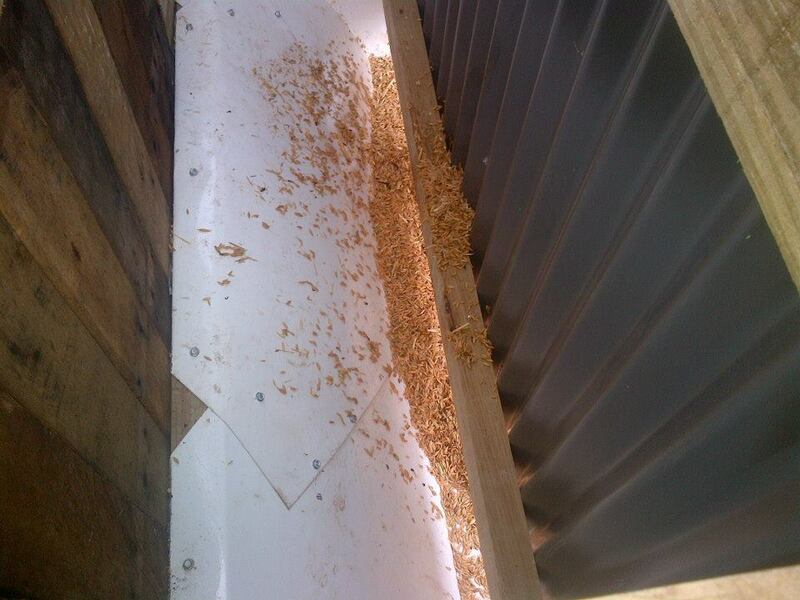 The pigs get mostly grain, but we like to mix it up as much as we can, as well as their free-range forage of course. We’ve started to score some waste baked goods, and have asked around at the local fruit-and-veg stores. The only one we’ve been able to get anything meaningful from so far is The Apple Man. 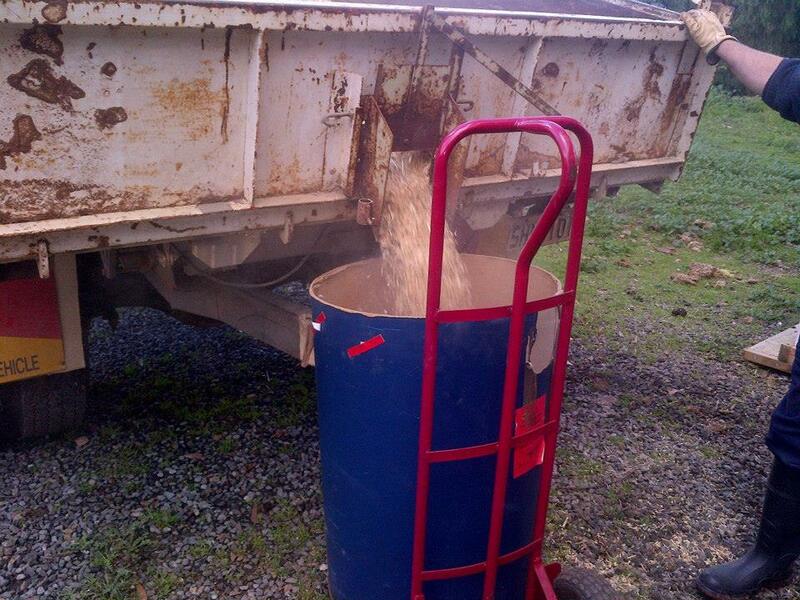 That half-tonne cost us $50, which makes it almost half the price of the bulk barley we currently have. Score! 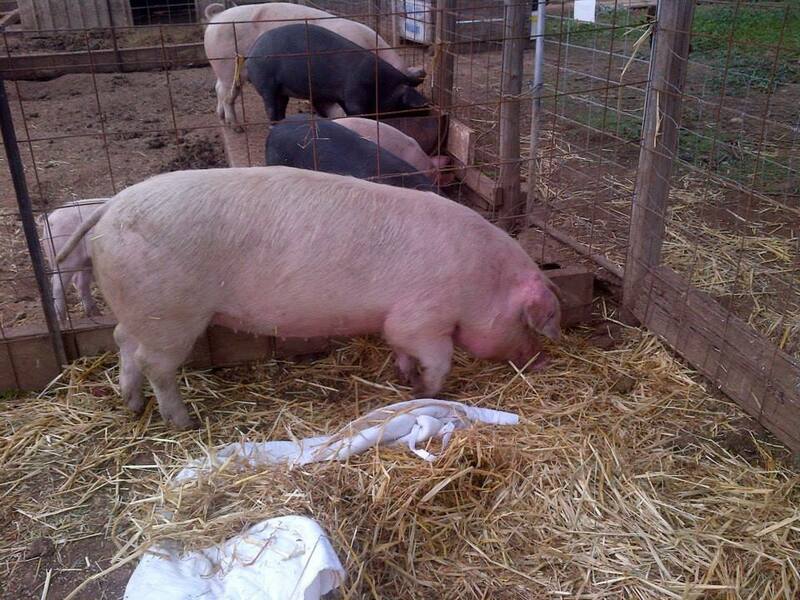 Anyway, we got the apples and started feeding them out to the pigs. Their morning feed was grain, and most of the evening feed was apples. On June 10th it looked like Ziggy was coming down ill. She was lethargic and off her food. She’s not the most active girl, coming from an intensively bred farm, but she was even more droopy than normal. On the 11th I was sure she was sick. She was laying down along the fence between the runs and clearly didn’t want to get up. I couldn’t even get her to lay down in her new house out of the weather, I think because she liked laying there where the next-door pigs could chat to her. She wasn’t eating or drinking, and it was getting quite cold. I was super-worried about her laying in the cold. I ended up getting a heap of straw, layering that over her, and then covering that with a couple of old quilts. No matter what dad will tell you, I definitely didn’t lay down next to her. I just knelt down and gave her some loves. Really, that’s all. This is the pig equivalent of a sick bed. On the 12th she was even worse, so I called the vet. We had another pig get similarly ill about a year earlier. The vet came out and it turned out that she only had a cold. He gave her some antibiotics, but she would’ve gotten better on her own. I was hoping Ziggy would work out that way, but after a full day of no food or water, I wasn’t going to just wait and see. In addition to that, Stumpy, her sister, was starting to get lethargic. We use the Production Vet from Roseworthy College, which is literally less than 10 minutes away. Dr. Mandi came out with two final-year students. They were awesome. Dr. Mandi thought it was the apples, and that the new girls, being intensively-bred, don’t have the stomach for them. The theory was that they had a huge belly ache. The problem is if they don’t eat every 24 hours, they start to develop gastric ulcers. Ziggy’s temperature was 41.5, which is also bad. The vet gave her a big dose of antibiotics and an anti-inflammatory, both via injection. We gave Stumpy the same, just to head it off. I had managed to get a little food into her on the Wednesday afternoon – some green weeds and a few handfuls of barley. The following day she was still laying down, but I was able to get her up. She ate and drank (she was super thirsty), and made a full recovery. Stumpy was also fine. I don’t think it was a stomach ache, as they never scoured. I think they had a cold/infection, and the drugs helped. Either way, the vet visit was well worth it, and literally cost us less than $200. I can’t remember the last time I took a dog to the vet for less than that, and this was a vet coming to us and dosing two pigs with drugs. The truly valuable thing about the visit was we got to speak about the partnering/management relationships they offer. For about $100 a month we can get a quarterly visit where they help with the herd and breeding management. They also have a world-renowned pig expert, who actually as a PhD in pig breeding. I didn’t even know that was a thing. We want to look at ramping up to a commercial venture. This vet deal will mean we can build a real relationship with our vet, and they will know all the ins-and-outs of us and our herd. 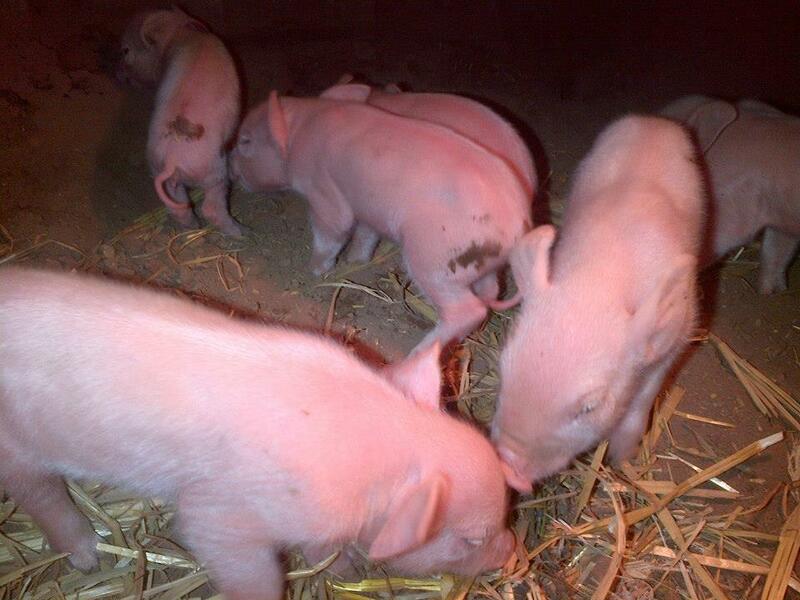 Even if we don’t end up making this a commercial venture, I’ll probably do it just for our little breeding herd here. 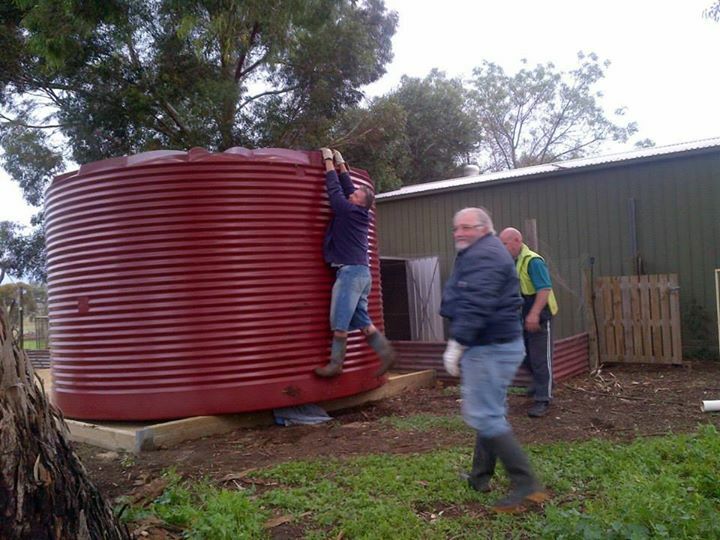 Our 2 x 23650 litre tanks were delivered and “installed” right at the start of June. That is, they were maneuvered into place and taps drilled in. 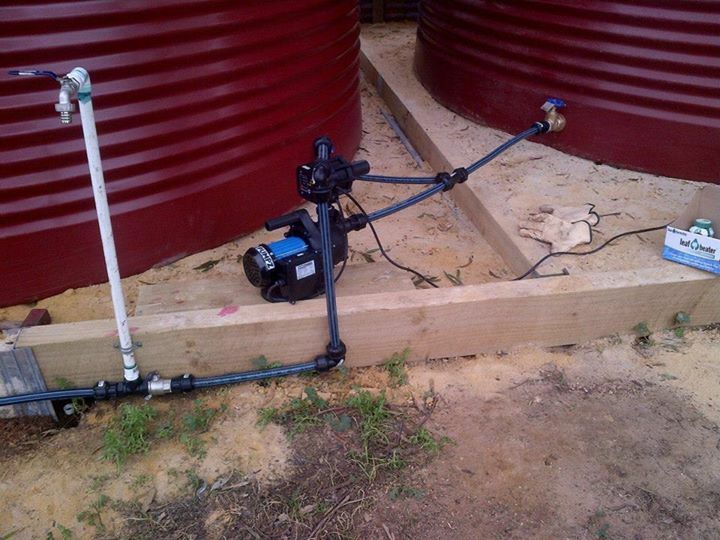 The plumbing in part came the following weekend. We had to have 3 of us there plus the driver. Up to this point, I’d been running back-and-forth trying to be helpful, but the driver had done everything. I took that opportunity to ham it up for Linhda. And over! This is what happens when you don’t let go. Proof that they made me roll one of these 420kg beasts up the hill on my own. The second tank going in. The plumbing was a little tricky. 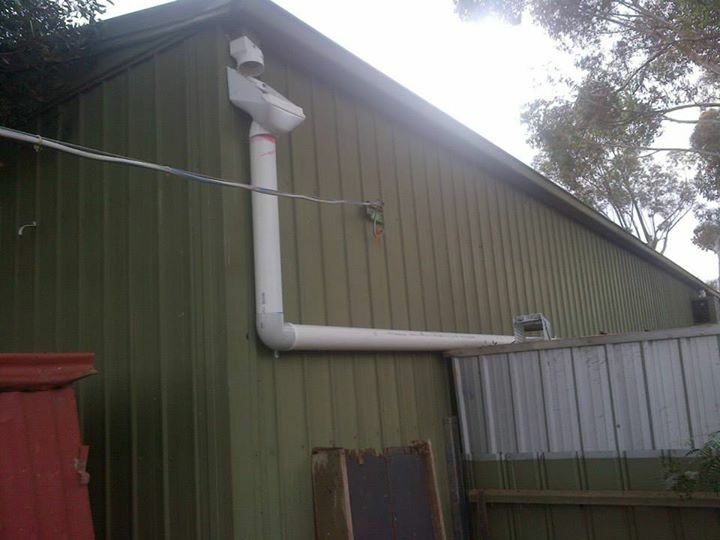 We want to collect from all of the downpipes on our big shed, plus one that comes down right next to it from the veranda. That last one is particularly important as the veranda covers a large area and some of the house roof dumps onto it. We’re not exactly sure what area is collects, but it’s potentially more than the shed. The real tricky part comes from the fact that it’s a “wet system”. That is, it runs along the ground to the tanks and then up to the inlets, which means that the pipes are always full of water. We also need to use in-line leaf catchers as the area is surrounded by huge gumtrees. This means the leaf catchers have to be above the level of the inlets, or water will come pouring out of the wrong end. 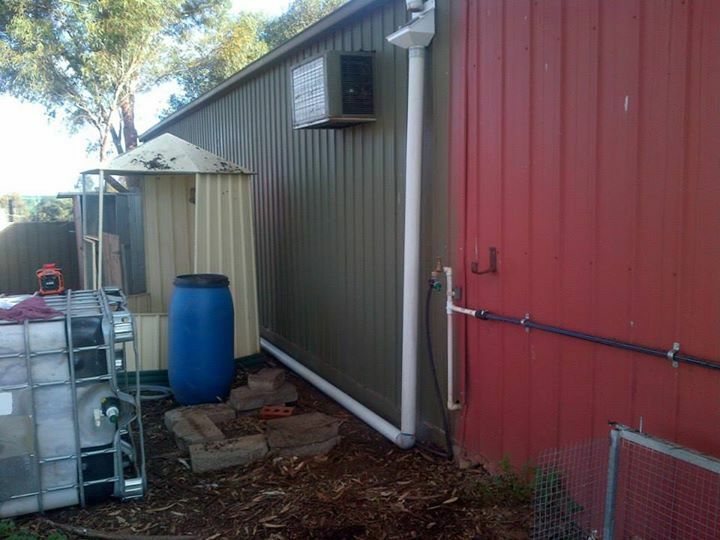 We can work that out pretty easily from the side of the shed near the tanks, but the other side took some doing as the veranda is low and the tanks are tall. We thought we were okay, but only just. Planulating the plumbing. This was Plan A, we ended up installing Plan D, and we’ve modified that once already. As it turns out, our plan changed a couple of times, and then our implementation changed once after-the-fact. The veranda collection point was just a little low for the amount of flow. The level of water in the pipe was below the leaf catcher, but the flow from the veranda was so high that it still overflowed. We ended up having to T the veranda pipe in below the leaf catcher, which is completely counter-intuitive. To make sure we didn’t collect trash from that pipe we put some mesh in and along that gutter, and we’ll have to get up there and clean it every month or so over the wet times. One of the two circuits. This is the easier of the two. This side of the shed was easy, as it was clearly higher than the inlet and was straight runs. 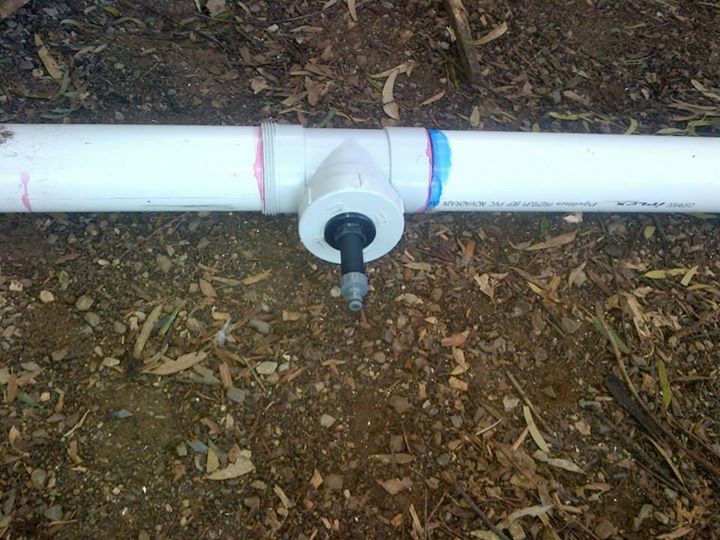 We installed this on a low point to allow us to flush out the system, but still keep the water we flush out. 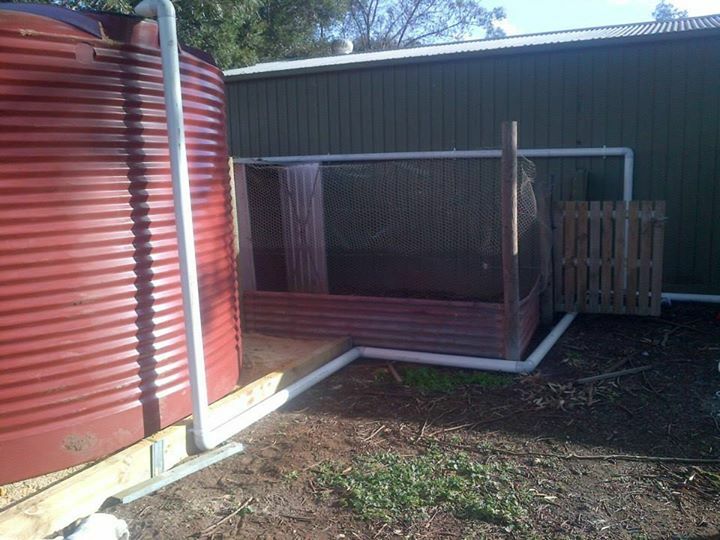 I used the duck shed to support part of this system, as they get quite heavy when full of water. We teed into the system here, meaning we can isolate the shed, pig runs, and most of the poultry and run them entirely on rainwater. I’ve worked out that we have just under 500 square metres under roof area, and maybe 70 of that we’re not collecting yet (one downpipe). 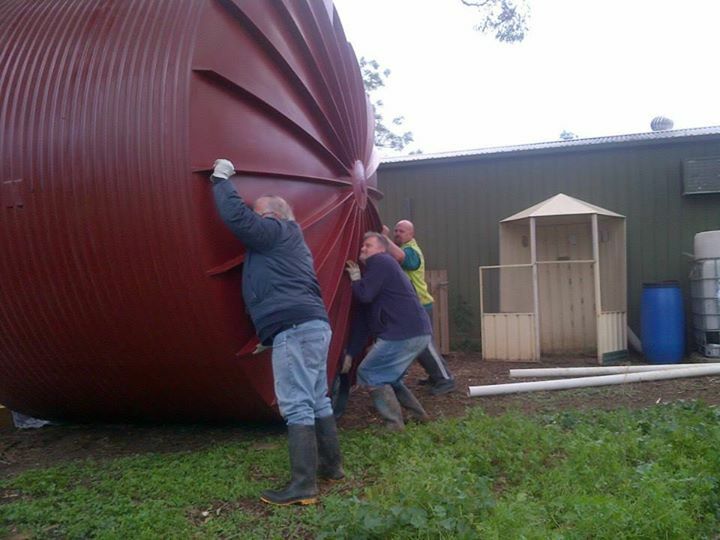 That means we can collect around 275k litres a year, but we’re collecting about 240k litres. 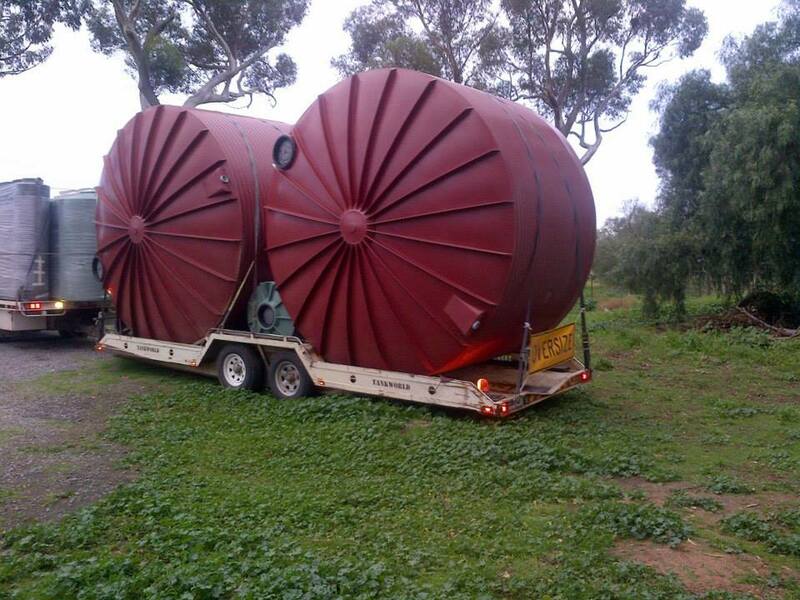 That’s heaps more than we thought, and probably means we need more tanks. In fact, I think we could do with two more at the size we just got, which would be one more on either side of the house in the collection areas.